GEW Conference takes place in American Center, Prague 1. Program is available HERE. On April 13, 2016, Deputy Chief of Mission Steve Kashkett opened a seminar on regulatory and compliance procedures for Czech manufacturers presented by Regulatory Compliance Associates (RCA), and their partner company Eiikon LLC. 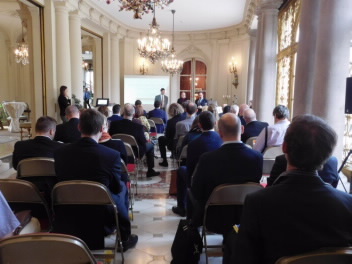 Czech healthcare companies gained insights on how to navigate requirements for regulatory and FDA pathways and funding from EU initiatives as well as information on manufacturing and distribution options in the U.S. and abroad. RCA provides worldwide services for the resolution of compliance, quality assurance, product development, manufacturing, R&D, technical and regulatory challenges for Food and Drug Administration (FDA)-related industries. The company’s services are used by life science companies in the medical devices, biotech and pharmaceutical industries including animal health, nutraceuticals and telemedicine/mHealth (mobile Health). Eiikon LLC brings the best practices of U.S. GPO (Group Purchasing Organization) contracting and supply chain services to markets beyond U.S. borders. The company provides reports and services to healthcare suppliers and providers for targeted sales and marketing using Eiikon’s extensive database. Eiikon has a strategic relationship with Regulatory Compliance Associates. On February 11, 2016, SpaRitual held the opening ceremony for their new showroom at the hotel Smaragd in Prague 5. U.S. Commercial Service representatives participated in the opening in support of the American company. “Slow Beauty for a Fast World” is the SpaRitual company philosophy behind their luxury range of multi-purpose vegan spa products and treatments for hands, body and feet. In the Czech Republic, SpaRitual is available in luxury salons, spa centers, hotels or at Bomton studios. In 2014, the company won an “American Spa” Professional’s Choice Award for its products. For additional information about the SpaRitual brand in the Czech Republic, please visit www.sparitual.eu. SpaRitual is also a member of U.S. Commercial Service Prague’s U.S. Beauty Brands Club. U.S. 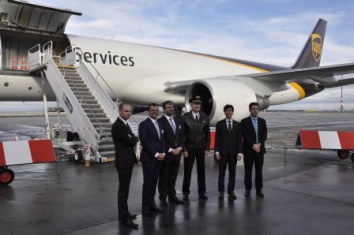 Ambassador Andrew Schapiro attended United Parcel Services’ (UPS) inauguration ceremony at Vaclav Havel Airport Prague on January 12, 2016, to mark the global logistics, freight, and supply chain services provider’s now daily cargo flights from Prague to its hub in Cologne, Germany. The Ambassador noted that “UPS is the first U.S. airline that operates daily flights to Prague throughout the year” and he hopes to see other U.S. operators follow this example. This step would promote even more business and closer cultural ties between the U.S. and the Czech Republic and would be deepened once the T-TTIP agreement (The Transatlantic Trade and Investment Partnership) is concluded by the EU and the U.S. The company’s move is a response to the economic growth it has been experiencing in Europe. Daniel Carrera, President of the UPS East Europe noted, “UPS is keen to help businesses of any size in the Czech Republic successfully trade in today’s fast-paced global economy.” UPS began its service in the Czech Republic in 1992 through a local partner. After acquiring that local company in 1999, UPS Czech Republic was established. Today, the company employs about 400 people and operates eight facilities in the Czech Republic. UPS is a global leader in logistics. Headquartered in Atlanta, USA, the company serves more than 220 countries and territories worldwide.